The company that bears jewelry designer Roberto Coin’s name was founded in 1977 in Italy’s Vicenza. This romantic environment is where 20 percent of jewelry created in Italy (an $8 billion industry!) originates. At that time, the business created and manufactured for other Italian lines; the Roberto Coin brand – a marvelous mix of centuries-old Italian craftsmanship and modern design techniques -– was launched in 1996, quickly becoming a world-renowned luxury brand of Italian designer jewelry. Each and every piece of Roberto Coin jewelry is unique and handcrafted, from the delicate to the bold; all are exquisite. Roberto Coin started signing his jeweler with the setting of a small ruby hidden on the inside of each piece in 1996 as well, beginning with the Appassionata collection. This exclusive signature in every Roberto Coin creation is a secret message – a gift really – to every woman who wears it. The designer himself said the ruby is a “…romantic way to wish the best to all the people wearing my pieces.” The hallmark ruby – known as “The King of Gemstones” – was the direct result of the designer’s reading a historic book about an old Egyptian legend that talked about ancient pharaohs considering the ruby as a magic stone, able to provide health, happiness and long life to those who kept it in close contact with their skin. Only synthetic rubies are used, to guarantee no stones set come from a region in turmoil. The same physical and aesthetic characteristic pertain to both natural and synthetic rubies. The mark of Vicenza, Italy, along with the signature ruby are two of the ways to determine authentic Roberto Coin jewelry. All of his pieces are classically designed and precision-crafted in 18kt gold (with and without gemstones). Roberto Coin is a master of light, shape and color. He uses materials that include 18kt yellow gold, white gold, and rose gold, diamonds, precious stones, gold and steel, wood and other supplies for his necklaces, bracelets, rings, earrings, brooches and pendants. Coin sketches, and gives the work to his designers, who work on computers to build-out his concepts in preparation for the model-makers. He is intimately involved in all aspects of his business; from design to manufacturing, marketing and finance. He consistently pushes the design and branding envelopes. Every polished diamond used in Roberto Coin jewelry are purchased from legitimate sources that subscribe to the Kimberly Process Certification Scheme (KPCS) and the System of Warranties. All of them are from conflict-free areas. More than 600 models for the most sought-after collections are produced each year, serving clients in Europe, Asia, North American and South America at more than 800 points of sale in 53 countries. Animale – Animals and insects are represented in this colorful, whimsical and charming collection, delivering sparkle, beauty and glamour. The 18kt gold bangles, rings and earrings feature, among many things, diamonds, fish, horses, scorpions and octopuses. Appassionata – Italian for the word “passion,” this delightful line features interlocking ribbed gold links in a basket-weave design. The earrings, necklaces, pendants, bracelets, bangles and rings feature a flexible, fabric-like movement. Art Nouveau – The floral motifs pay homage to European innovation and design. Barocco (and New Barocco) – Gold threads are twisted and woven to form textural, open pieces inspired by the elaborate style of Barocco architecture. Black Jade — Gold wrought in a concave shape, the pieces in this collection feature black jade from Africa and bold-colored green agate set in rose gold. Bold Gold — Also known as the “Love Chain,” the earrings, necklaces and bracelets in this collection are comprised of seemingly uninterrupted links of contrasting satin and high-polished precious metal. Bollicine – An effervescent collection that’s reminiscent of champagne bubbles, it is at-once bold and delicate. Options include 18kt yellow and white gold – with and without diamonds – and also an enamel version. CapriPlus – This smooth, contemporary line (launched in 2009) is based on the vibrant colors and contrasts of the Mediterranean; think sunset on the isle of Capri. Pieces are available in a variety of gemstones and metals, along with mini and petite versions. Cento – Italian for “100,” this innovative diamond cut – patented by Roberto Coin – features 100 facets (versus the “usual” 57) to deliver a longer light refraction. The result is an amazing kaleidoscopic effect in a floral pattern. All stones over .07 carats have a FL to SI clarity, meaning they are flawless or have small inclusions not visible to the naked eye, and are colorless or near-colorless. They are also certified and laser-inscribed. A cento diamond has nine-fold symmetry and takes 12 to 15 hours to cut. Chic & Shine – A modern look for every day can be achieved with these high-polish-flat-link earrings, pendants, cuff bracelets and cuff rings. Class & Color Cento – Italian for “100,” this innovative diamond cut – patented by Roberto Coin – features 100 facets (versus the “usual” 57) delivers a longer light refraction. The result is an amazing kaleidoscopic effect. Classica – The simple and weightless design of this refined collection include diamonds. Cocktail – This line “serves up” statement pieces! Diamond Collection – Elegant and luxurious pieces to wear separately or stacked. Diamonds by the Inch – Delicate chains and bezel-set stones are feminine, sophisticated and youthful. Dubai – Intricately woven threads of gold shimmer and impress in marquise-shaped openwork. Elefanto – The effect of elephant hide is caused through the textured and intricate design of this collection. Fantasia – White diamonds, champagne diamonds and colored sapphires celebrate the reflection of light, sparkling brightly on ears, around necks, wrists and fingers. Earrings, pendants, necklaces, bracelets and rings are available. Florentine – Artisan craftsmanship and flawless attention-to-detail are two hallmarks of these gold pieces. Haute Couture – This lavish, exclusive collection contains strong and distinctive pieces; one-off jewels that are true originals, paying tribute to high fashion. They consist of rose and white gold adorned with diamonds and other select gems. Hoop Earrings – Whether round or oblong in shape, the components of this chic collection complement any and all wardrobes with their versatility. Ikebana – These bold and dramatic creations are a tribute to the Japanese art of flower arranging, and evoke the principles of minimalism, emphasizing shape, line and form based on a scalene triangle, whose points represent heaven, earth and man. Pink gold settings have pave diamonds, onyx, coral and turquoise. Ipanema – A bold and colorful collection inspired by vibrant Ipanema Beach in the southern part of Rio de Janeiro, Brazil. Pieces include earrings, pendants, bracelets and rings in 18kt yellow gold with various semi-precious stones, including quartz, citrine, amethyst and blue topaz. LeBois – A novel collection, the pieces represent wood translated into gold. Love Plus – Those “three little” words – “I Love You” – are engraved in multiple languages on the pieces of this collection that are an ode to love. Martellato – Sleek and contemporary hammered gold pieces allowing light and shadows to dance across the surface of the collection’s earrings, necklaces, bracelets and rings. Mauresque – The romantic and enchanting pieces of this line were inspired by the Moorish architecture and 15th-century weaving tradition of Andalusia, Spain. Puffed earrings, pendants, necklaces, bracelets and rings are available in 18kt rose and yellow god, both with and without diamonds and other exotic gems. Nemo – Mythical divinities and marine creatures with movable links. 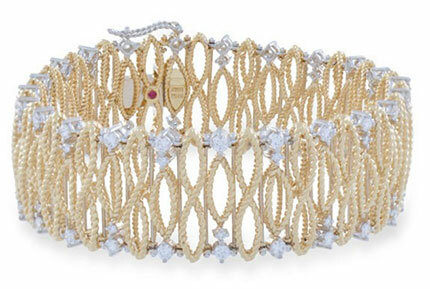 Pieces are crafted in enamel, white gold and yellow gold semi-rigid mesh, along with white gold and diamonds. Octopus – A subtle and delicate aquatic-themed collection featuring bracelets with a cephalopod mollusk whose tentacles are colorless and brown diamonds and black sapphires that wrap around a wrist. Pallini – An innovative design of 18kt gold beads results in ultra-chic and modern pieces of jewelry. Earrings, bracelets and necklaces in various chain lengths and styles are available. Pois Moi — A simple, linear design with ultra-modern appeal. The pieces take their cues from pattern and texture, with the shape reminiscent of 1950s TV monitors. A perfect combination of modern design and vintage sensibility. Primavera – Italian for “spring,” this collection is lightweight and flexible. Wear them alone or stack them. Quadrifoglio – Crafted exclusively for the Platinum Guild, this collection featured a necklace, ring and earrings in platinum with diamonds and tsavorite. Shanghai – A return to the Far East, with semiprecious peridot, iolite, topaz and diamonds in gold. The Perfect Diamond Hoops – Round brilliant diamonds inside and out share perfect symmetry. A timeless, sleek and radiant look. The Perfect Hoops – Roberto Coin’s classic circles show continuous beauty – inside and out. Tiny Treasures – Effortless, elegant 18kt gold and diamond pendants. Small in stature but large on looks! Vulcano – Gems “flow” in rounded, organic shapes in the pieces of this collection, much like lava from a volcano. Among the notable names who are fans of and wearers of the brand: Isabelle Adjani; Christy Turlington Burns (who became “the face” of Roberto Coin in 2007 for three campaigns, who teamed with Coin in 2009-2010 in support of CARE, a leading philanthropic organization fighting global poverty); Hilary Clinton; Melissa Etheridge; Jenna Fischer; Jodie Foster; Jennie Garth; Salma Hayak; Jennifer Hudson; Ashley Judd; Alicia Keys; the King of Morocco, Diane Lane; Jennifer Lawrence; Jennifer Love Hewitt; Demi Moore; Emmy Rossum; Brooke Shields; the Sheik of Dubai, Sofia Vergara; and Oprah Winfrey, who was the 2013 recipient of Roberto Coin-designed Sherry Lansing Award that recognizes a woman who is a pioneer and leader in the entertainment industry. The award is sterling silver and 18kt gold plate with diamond detail on the top that replicates the 100-faceted Cento diamond. 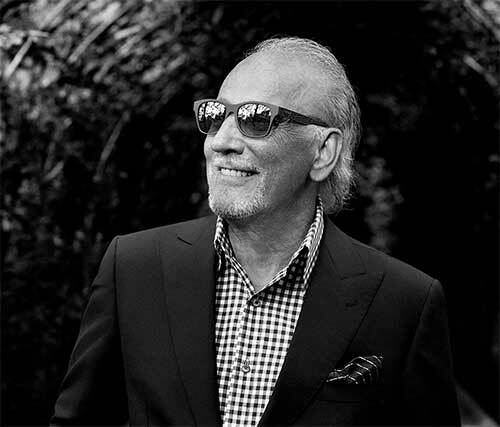 Roberto Coin has made history as a daring innovator. A creative genius, he turned a childhood dream into a career, fueled by a passion for fashion and an entrepreneurial spirit. He was sent to boarding school in Switzerland after losing his parents at a young age. There, he studied the hotel trade, becoming one of the youngest hoteliers in Europe (at the age of 24). He worked in Guernsey in the Channel Islands and several European countries before selling his hotel and using the proceeds to change careers at the age of 32. He is both a testament to following one’s dreams and perseverance. Roberto Coin is a participating member of a number of associations and organizations within the jewelry industry: the American Gem Society; Jewelers of America; Jewelers Board of Trade; Jewelers Vigilance Committee; MJSA; NY Chamber of Commerce; and the Council for Responsible Jewelers. He sits on the board of the World Diamond Council, and is also active within the greater social community at-large. The designer is the guest-of-honor at the springtime International Diamond Week, held on the trading floor of the Israel Diamond. He won the Palladio International Award for the best brand in corporate social responsibility. Roberto Coin was the Official Jewelry Sponsor of the 2013 American Gold Cup. An on-site boutique at the event with his fall collection was unveiled at the show jumping event. He received The Centurion Design Award at the Centurion Jewelry Show for his black and white diamond and green garnet cobra bracelet. Miss World Australia Jessica Kahawaty is announced as The Middle East Brand Ambassador for Roberto Coin. Roberto Coin creates three signature bracelets in support of the fight against pancreatic cancer, teaming with The Lustgarten Foundation; a portion of proceeds are used to fund research. He was awarded the Platinum Design Award in the Trends category at the BaselWorld Swiss trade show. The designer donated the painting “Madonna with Child & Landscape,” by artist Silvano Vecchiato (a student of Annigoni), to benefit the Orphans of Haiti. The artwork was made with thousands of carats of precious stones, including black sapphires, diamonds, pearls, rubies and aquamarines. The Fifth Season by Roberto Coin brand makes its debut (an exclusive collection designed specifically for the American market follows in 2012). This silver jewelry collection in yellow, white and rose gold finishes features diamond and semi-precious stone accents. The signature Roberto Coin ruby is hidden on each piece. A Lifetime Achievement Award is bestowed upon Coin in the spring, presented at the Middle East China Diamond and Jewelery Summit in Dubai, in recognition of his commitment to and career in Italian style.